5+ hour instructional DVD set shows how you can do anything with fiberglass: lengthen a body, hang a door, build a dash — you name it, you can do it! If you’re building or planning to build any kind of fiberglass bodied hot rod, this is the tool you need. Plus, special bonus video coverage on Fiberglass Top Modifications. In response to many requests for more of Bob Hamilton’s informative StreetRod 101 hot rod “how to” videos, we are proud to announce the second in the successful series is now available — and it’s a huge 3-DVD set covering every aspect of street rod and hot rod fiberglass body modifications! Once you view these incredibly detailed DVDs you’ll truly feel empowered and ready to tackle any fiberglass body modification you might wish to make. Whether you want to lengthen your body, add an opening door, fabricate and install your own custom dash, put in a floorboard, add a smooth firewall or just get rid of the bumps, waves and wiggles on your own fiberglass body now you’ll know how to do it the easy way after watching Bob do it and listening to his thoughtful advice. 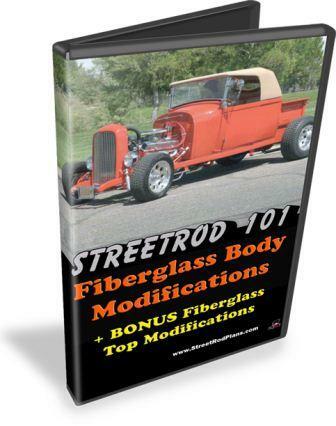 Easily learn how you can do anything with fiberglass: lengthen a body, hang a door, build a dash — you name it, you can do it with the second entry in the popular StreetRod 101 instructional DVD series! It doesn’t make any difference what kind of body you have. The years of knowledge, insights and helpful tips Bob reveals will get you through it with ease. While he uses a ’28 Ford roadster pickup body in this DVD series, you can apply the principles to your T-Bucket, Deuce, Austin, Topolino or whatever: roadster or coupe. Speaking of coupes, we included a special bonus video on Fiberglass Top Modifications, where Bob takes a fiberglass top made for a roadster and modifies it to fit a roadster pickup and shows how to include a unique latching mechanism that lets the top stand up when open. So, get ready for over 5 hours of fun, fascinating fact-filled instruction in this new 3 DVD set. If you’re building or planning to build a fiberglass bodied hot rod, this is the tool you need. Even if the only fiberglass you’ve touched before was brushing up against a Corvette fender you’ll confidently complete whatever ‘glassing project you now undertake. Just remember, there are thousands of unfinished fiberglass hot rod and street rod bodies out there you can pick up for a song because the seller didn’t know what to do with it or was afraid to pull down his sleeves and get to work on it! Budget hot rod opportunity is knocking on your door and now you’ll be ready. To give you an idea of the depth of knowledge you’ll gain from these DVDs, we’ve listed just some of the topics Bob covers. There’s much more, but we want to leave some surprises for you! Fabricating large, flat fiberglass pieces for firewall, etc. Constructing an innovative inner support structure for dash, pedals, doors, etc., including support for windshield posts, steering column, swing pedals, master cylinder, heater, stereo, etc. We’re excited to be able to offer this comprehensive information to the hot rod building world as the second installment in Bob Hamilton’s StreetRod 101 DVD series. You get it all of this promptly delivered to your mailbox on a high quality, 5+ hour DVD set that you will use regularly and treasure for a lifetime for only $24.99 plus $5 shipping and handling ($15 international). Just click on the “Add to Cart” button below. And while you’re at it, you can also add the other volumes in the StreetRod 101 DVD Library at big multiple DVD set savings, too. Very good dvd ,all the right info. and help that I might have expected. Great video for anyone new to fiberglass work. I bought the 3 video set and they are all great! If you’re interested in fiberglass work, this video is a must have. Great DVD it answered all the questions that I had about fibreglass body modifications. Great dvd with lots of helpful info. Worth the money if you have limited experience with glass. This video answered so many questions, that it alone was worth the price.